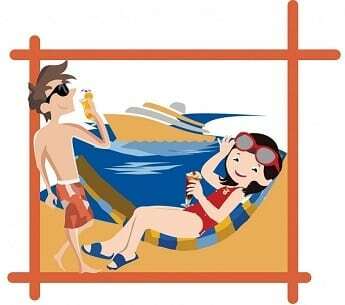 There are many benefits to staying at a hotel near the cruise port the night before your cruise is set to depart. While we won’t go into too much detail, trust us that there is nothing worse than arriving at your ship tired and jet-lagged! Not to mention, the stress of potential flight delays or traffic in the area. 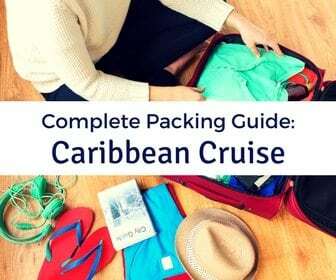 We have been there, done that, so now we always book a pre-cruise hotel stay. 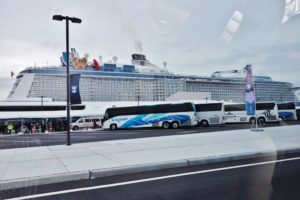 Even though we live only a four hour drive away from Cape Liberty Cruise Port in NJ, we still decided to do a pre-cruise stay for our Quantum of the Seas cruise. Given the time of year, January, of course there is always the possibility of bad weather, so we booked a hotel just in case we needed to adjust our travel plans. With the weather forecast calling for mild temperatures and overcast skies, we could have canceled our hotel and just driven down the day of the cruise, but what fun would that have been? 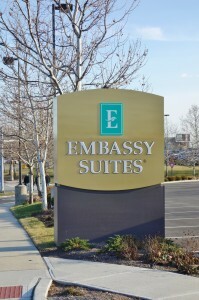 So, we loaded up the Jeep and headed down I-95 to NJ for our pre-cruise stay at the Embassy Suites Elizabeth, NJ. 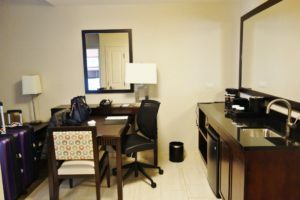 We compared several different hotels near Cape Liberty Cruise Port, and while there were many great options, we decided to go with the Embassy Suites because of previous experiences at this hotel brand in Fort Lauderdale, FL. Plus, the hotel had many comparable features to the other hotels we were considering. We booked the hotel 6 months in advance and got a rate of $179 a night for a king-bed suite. All the rooms at this hotel are suites, with two separate rooms that let you spread out and prepare for your cruise in style. We will get to the room details in a bit. The drive down was smooth with virtually no traffic, beyond the expected slowdowns approaching Manhattan. Our GPS guided us to the hotel with no issues. So if you are driving, you should have no problem locating this hotel. 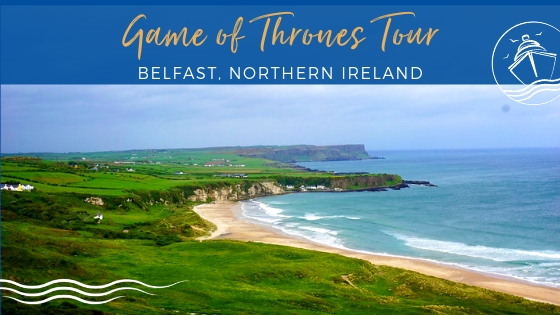 It is also located about 3 miles from the airport and has a shuttle to bring you to and from the airport-you need to reserve the shuttle in advance by contacting the hotel though. 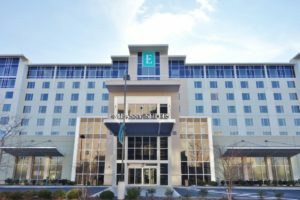 The Embassy Suites Elizabeth, NJ is located in a little U-shaped area along with three other hotels-Country Inn and Suites, Courtyard Marriott, and a Residences Inn by Marriott. Embassy Suites is all the way at the front of this area, right across the street from the Outlet Collection at Jersey Gardens Outlet Mall. All the hotels in this area look fairly new, and the Embassy Suites main entrance is quite inviting. It is definitely the most impressive exterior of all the hotels in this area with the glass entrance way. There is a a small loading and unloading area in front of the main door to allow travelers to park for a few minutes when they first arrive. This is also where you wait for taxis and shuttle buses. The lobby of the hotel is very impressive. The tall, open area makes you feel like you have walked into a much more expensive hotel. All the glass lets in a lot of light, showing off the modern furniture and trendy decor. Located in the center is a beautiful water feature that gives travelers a sense of tranquility as they come storming through the main entrance. The bar and restaurant area is off to the right as you walk in, and the large main desk area is off to your left. There was no one in line when we arrived, so check in took only a few minutes. Smooth sailing so far! We were given a suite on the first floor, near one of the side entrances to the hotel. Parking at the Embassy Suites Elizabeth, NJ was plentiful- a sizable side lot and additional parking near the rear of the building. We ended up parking toward the back, so we could see our car from the room. The Embassy Suites in Ft. Lauderdale had sizable rooms, but with slightly older decor. In fact, they were renovating during our last stay there. This was not the case at the Embassy Suites Elizabeth, NJ. Our first impression when we walked through the door was WOW! 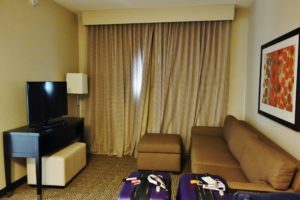 Directly in front of us was a nice sitting area with one of the TWO flat screen LCD televisions that come standard in the room. With a love seat and moveable ottomans, this area was plush and comfy. Off to the right was a workspace area with a number of outlets for charging all those electronic devices. I took this time to do some blogging and tie up work related stuff, while the Princess sat around on her iPhone. This area was comfortable and well light, so it was easy to get work done. One thing we neglected to notice when booking was that WiFi was an additional charge. Directly behind the work station was the wet-bar area; the stone counter top include a coffee maker, microwave, and mini fridge. This was not necessary for our one night stay, but it would have been convenient if we needed to store anything. The bathroom here rivaled any hotel we have stayed at for size and features. With an over-sized shower and an ideal layout, the bathroom greatly exceeded my expectations. Plenty of towels and toiletries were provided, so we could be so fresh and so clean for Quantum of the Seas. Our king bed was located in the second room, off to the left side of living room. It did feel a bit tight, especially given the abundant space in the living room and bathroom, but it was more than adequate for our stay, complete with a second television. Here, we were able to get a refreshing and sound night’s sleep. Being near the airport, there was some slight noise, but honestly, within a few minutes we had habituated to the sound. The hotel has an indoor pool and a fitness center, which we did not use. But more importantly, all Embassy Suites have a Welcome Reception-one reason why this hotel brand wins favor with the Princess. Due to New Jersey law, this reception can only include one free drink, which is clearly stated on your ticket. What we did learn a bit too late to take much advantage of it was that to compensate for this law, the reception has $2 cocktails. We headed to the reception, located at the bar, about 15 minutes after the scheduled start time. Some fellow travelers were already getting their cocktails and snacks, but we were able to get seats off to the side of the bar. The snacks provided at this reception included chips and salsa, chips and dip, cheese and crackers, and even some humus and vegetables. The plan was to grab some snacks and a drink, then get dinner at the restaurant, called the Liberty Grille. After munching on snacks for a while and finishing our drinks, I tiptoed over to the restaurant, which was completely empty. I asked a staff member if it was open, and he said yes, but they would be happy to bring the food out to the bar area or even to our room. We opted to sit in the dining room. The menu was a standard hotel restaurant menu, with a few starters, sandwiches, and a limited number of entrees. Our dinner order consisted of a hamburger for me and a chicken sandwich for the Princess. Both of us were pleased with the food, especially the french fries, but service was a bit slow given that we were the only patrons in the restaurant. A few other travelers did filter in towards the end of our meal, but the restaurant remained relatively quiet. Upon receiving the bill, I noticed that I was only charged two dollars for my beer, so I inquired with our waiter. 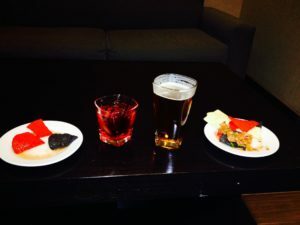 He indicated that beer and basic cocktails were served at this reduced cost during the Welcome Reception. With that being said, the Princess and I made sure to get one more round of drinks to bring back to the room. The next morning, we of course had to make time for the complimentary breakfast. Hey, it was the first day of the cruise, so we had to start it off right! There were plenty of options at the buffet stations including sausage, bacon, home fries, cereal, toast and bagels, and more. There was also a cooked to order section where you could get omelets, pancakes, or french toast. We both opted for omelets. 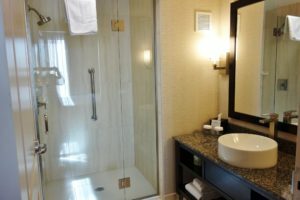 To summarize our Embassy Suites Elizabeth, NJ review, we found the hotel to be a lovely option for our pre-cruise stay. 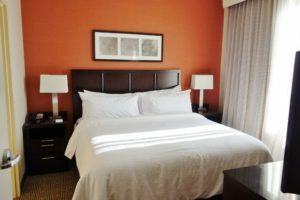 Our room offered plenty of space and comfortable furniture. The Welcome Reception and complimentary morning breakfast were also great features. The check in and check out process were both smooth and effortless, and the staff were friendly and courteous. 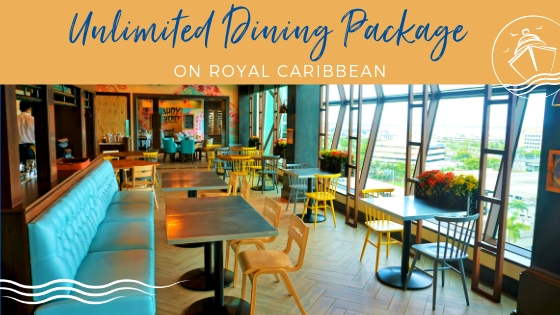 The lobby and bar area have a hip, urban feel where you can definitely spend some pre-cruise time socializing or having a bite to eat. 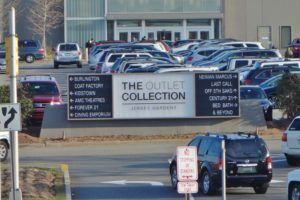 You really don’t need to leave the hotel if you don’t want; although, being located right across the street from the outlet mall, your wife may drag you shopping. And, our car was still there when we returned from our cruise. That is always a good sign! The only feature left unchecked in our minds was transportation to and from the cruise terminal. When staying at the Embassy Suites Elizabeth, NJ, you do need to book your own transportation, which cost us $65 each way. There are a few other hotels in the area that include transportation. Besides that, the location and modern upscale feel of this hotel is well worth the charge. 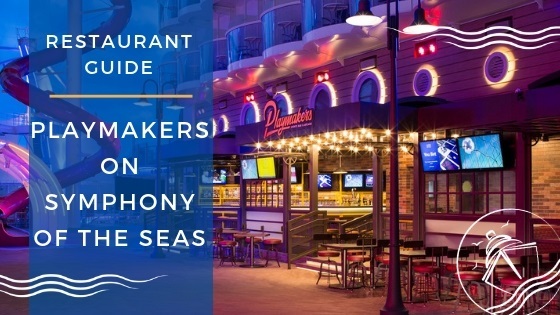 When we sail on Anthem of the Seas in 2016, the Embassy Suites will be a contender again for our pre-cruise stay near Cape Liberty Cruise Port. 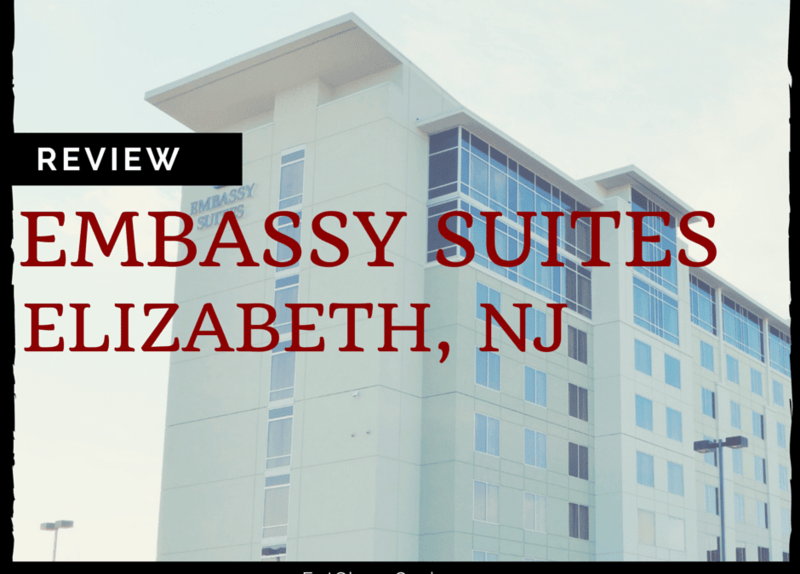 Have you stayed at the Embassy Suites Elizabeth, NJ? 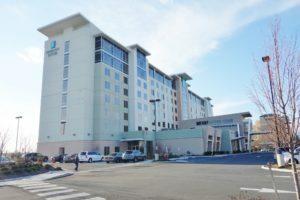 Or is there another hotel you prefer in the Cape Liberty Cruise Port area? 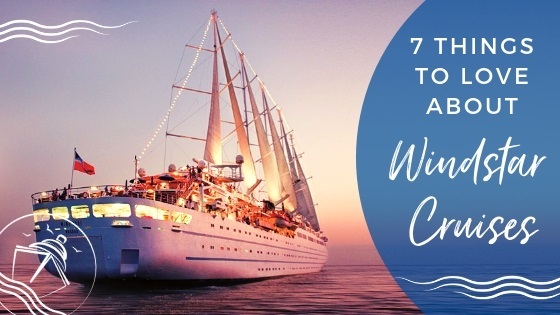 Drop us an anchor below to give your fellow readers some suggestions and tips about which hotels are the best for pre-cruise or post-cruise stays in this area. Hi, just a quick question on what car service you used while at embassy suites. Thanks! HI Maurice, Thanks for reading the review and reaching out. We had the hotel call a private car for us, so I did not get the car service’s name. That is my bad as they were not very friendly, and would never recommend them, so I wish I knew the name so I could tell you to NOT USE THEM. 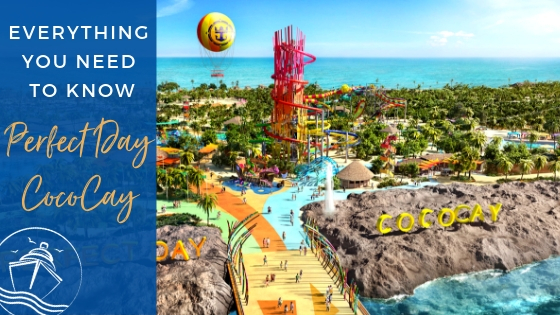 I do believe now the hotel offers a Park, Ride, and Cruise package that includes transportation for two to the cruise terminal. Not sure if they have a van or source it to a third party. I would call the hotel and ask. 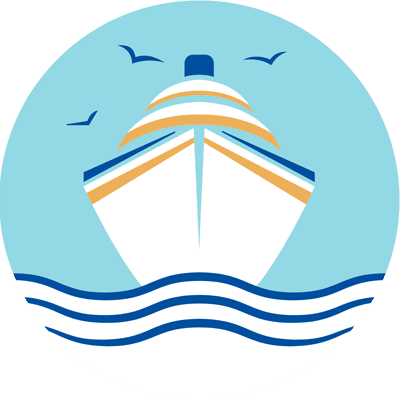 When are you cruising from Cape Liberty? Hi, thanks for the quick response and feedback. 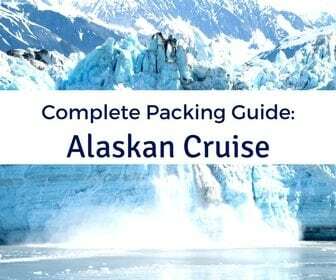 We are cruising late September so i’d like to finalize my transport options. Hi Maurice, just wondering if you ever contacted Embassy Suites about the transportation? It would be great to know so we could update the review.